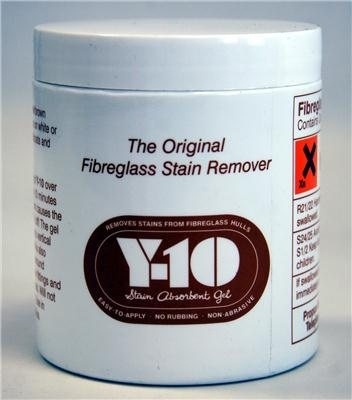 The world renowned Y10 Fibreglass Stain Remover is easy to apply, no rubbing and non-abrasive. Y-10 rapidly absorbs yellow/brown waterline and transom stains on white or lighter coloured fibreglass sailboats and powerboats. Application: To use, brush a thin coating of Y-10 over the stain, wait approximately 10 minutes while a mild chemical reaction causes the stains to vanish, then wash it off. The gel spreads easily and adheres to vertical and overhead surfaces. Its also effective against rust stains around engine exhaust ports or other fittings and may be used on painted boats. Use in temperatures above 10 Celsius. It has been known to have removed waterline stains on a 26-footer - twice! Please note, gelcoat will not be damaged when applying Y10.